With our Quote of the Week, we continue our series about poverty. This week, we focus on one of the pillars of the War on Poverty and one of the great engines and equalizers of our society: education. Sargent Shriver tackled his poverty work in the same way he tackled most things -- with confidence, optimism, and ambition. His vision and positive attitude are evident in our Quote of the Week. 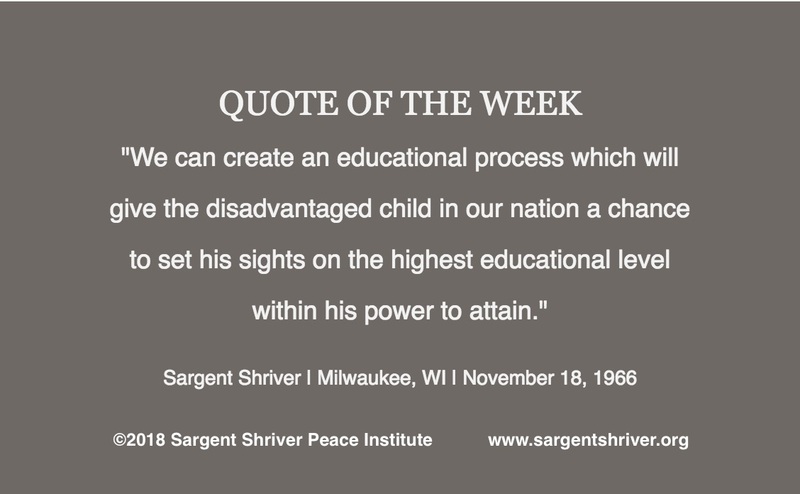 During a speech about education to the Great Cities Research Council in Milwaukee, Sargent Shriver spoke about Head Start, the early childhood education program that became one of the more popular War on Poverty programs during his time as Director of the Office of Economic Opportunity (OEO). However, his description went beyond the parameters of Head Start, which was designed to provide educational resources to economically disadvantaged preschoolers and their parents. In the speech, Sargent Shriver sketched out a plan for an entire educational system that would build on the advantages of Head Start at all levels of study. We invite you to read Sargent Shriver’s ambitious education plan, which outlines a holistic approach to quality education for all young people in public schools, allowing all children to reach their full potential. Sargent Shriver and his OEO team were able to roll out Head Start programs in communities around the country. But because the government’s focus shifted away from the War on Poverty towards the end of the 1960s, much of the educational plan he discussed in this week’s speech remained unfulfilled. In 2018, Head Start continues to support young children and their families. But imagine the potential we could unlock if we could create an entire educational system that would allow all children to reach their full potential. As Sargent Shriver was known to say, we have the resources to do this – but do we have the will?